It was su-su-summertime and my husband and I decided to cash in some miles for a trip to Italy and Greece. 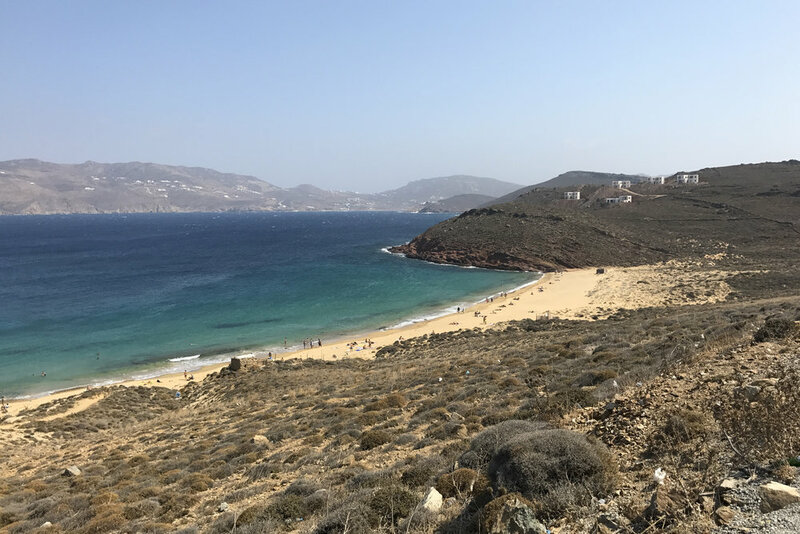 The three most prominent islands are Mykonos, Santorini and Crete, so we thought that'd be a good selection for our journey. Mykonos, party vibes. Santorini, couple vibes. Crete, family vibes. We got into Mykonos late in the evening, and spent some time exploring Old Town by night. It's lively with bars, clubs and restaurants at every corner. We wandered through the maze of white buildings and painted cobblestones, and sat down for a couple drinks and hookah at Loya. Old Town by day has a different vibe. In the sunlight, the white buildings reflect the light. It feels quaint and beautiful. We wandered through the alleys to visit the iconic windmills that were mostly built in the 16th century to mill wheat. This part of the island is so windy it feels like you'll blow right off the cliffs into the ocean. Watch your hats! Little Venice is right next to the windmills, a facade of restaurants and bars that were built right on the ocean. You can dine overlooking the Aegean Sea. Paraportiani Greek Orthodox Church is another great sight to see in Old Town. It began construction in 1425, and like all of Old Town, is a beautiful building gleaming white right along the oceanside. If you're into adventure I highly recommend renting scooters or an ATV for a day to tour around the island. The views are amazing and you can stop and swim at the different beaches. 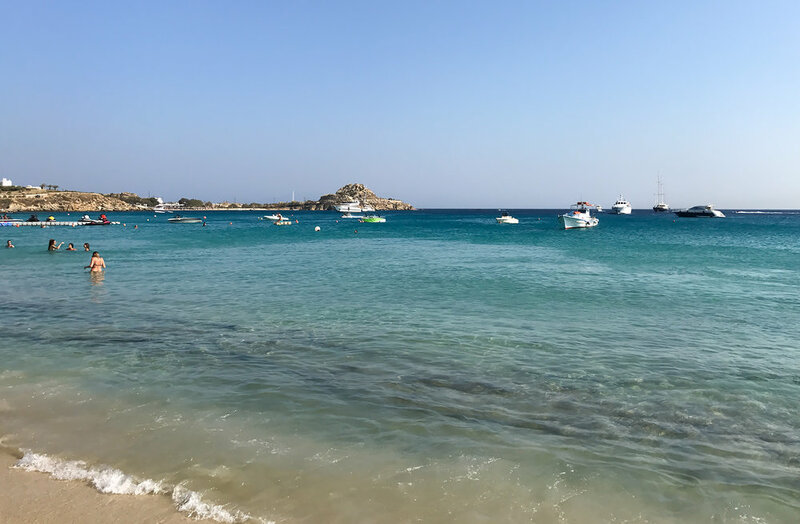 Agios Sostis Beach is a beautiful open beach that feels more local. There aren’t any beach clubs, restaurants, or chairs here so you’ll need to bring towels. The water is gorgeous and it has a peaceful and quiet vibe. There isn’t any shade, so wear plenty of sun screen. This is where there are cheaper drinks and a party crowd. The DJ and sound were not great, but it’s a beautiful beach and more affordable cocktails. We snagged a few lounge chairs and went swimming around sunset but the day crowd was winding down so it wasn’t too poppin’. This is your more upscale, Vegas-like beach club with amazing atmosphere. Better sound systems, better DJs, gorgeous ambiance, and drink prices to match. I prefer this over the cheesy Paradise Beach scene, but it's a pretty penny. SantAnna would be my recommendation for a club day. It has several pools, DJ, lounge chairs, and a bohemian vibe. We stumbled upon this place thinking it was Scorpios and sadly didn’t get the chance to go back and experience it fully. If you're in the mood to relax on the beach with a cocktail in hand you can rent a lounge chair and umbrella at Narayan's Beach. It's a gorgeous beach lined with restaurants and bars. The water is crystal clear with a sandy bottom, you can come here to layout, swim and read in the sun. This hike is a great way to view the gorgeous coastline of Santorini. Some sections are lined with restaurants overlooking the ocean, and some are more quiet with views of the caldera. We hiked most of the way before losing all sunlight, then found a cute little euro stand for some quick eats. We did a wine tasting tour with Santorini Wine Tours, and it was wonderful! We visited 3 wineries, all the while learning all about how wine is made on Santorini, which is quite unique. The first winery, Venetsanos, had amazing views of the Aegean Sea. We had some delicious appetizers to pair with our wines, that we learned are mostly made from Assyrtiko grapes. The vines are grown in "baskets" instead of on the vine, to help keep them cool and shield them from the wind. Our second stop was Avantis, a quaint wine room with the most delicious rose. We sipped, and the majority of us bought bottles here. Our last stop was Gaia, where the winemaker is very experimental with his winemaking. He's even tossed a batch into the ocean to see how it will age under the sea. Oia is a photographers paradise. It's what everyone thinks of when they imagine Greece with the blue capped Greek Orthodox white churches on cliff's edges overlooking the great blue ocean. Add some sunset glow and bam! It's the perfect setting for a romantic stroll or a dinner with a view. There are countless restaurants in Oia that have a fantastic view of the Aegean Sea. The sunset cruise is the best trip you can take on the island. It includes swimming, visiting the Nea Kameni volcano, sunset views of the island, and a delicious Greek buffet with wine. Adam and I had been to Santorini back in 2010, and it's still my favorite activity I've done in Greece to date. It's cheap to rent scooters on Santorini. What better way to see the island than with the warm breeze against your back? There are some unique beaches on Santorini, the most notable is the Red Beach. It's crowded, but stunning. We used points to stay at the luxurious Blue Palace Hotel. The rooms were incredibly spacious with beds that felt like sleeping on clouds. We spent many hours relaxing at the multiple pools and lounge chairs overlooking the island of Spinalongha. We also visited the spa several times to enjoy the indoor pool, steam rooms, and jacuzzis. The island of Spinalonga was originally part of the island of Crete. During Venetian occupation the island was carved out of the coast for defence purposes and a massive fort was built there. The island was at one point used as a leper colony. This island is a short boat ride from the coast of Crete so we went to browse the historic ruins. We stayed for about an hour and a half but I could've stayed longer, there are a lot of buildings to explore.